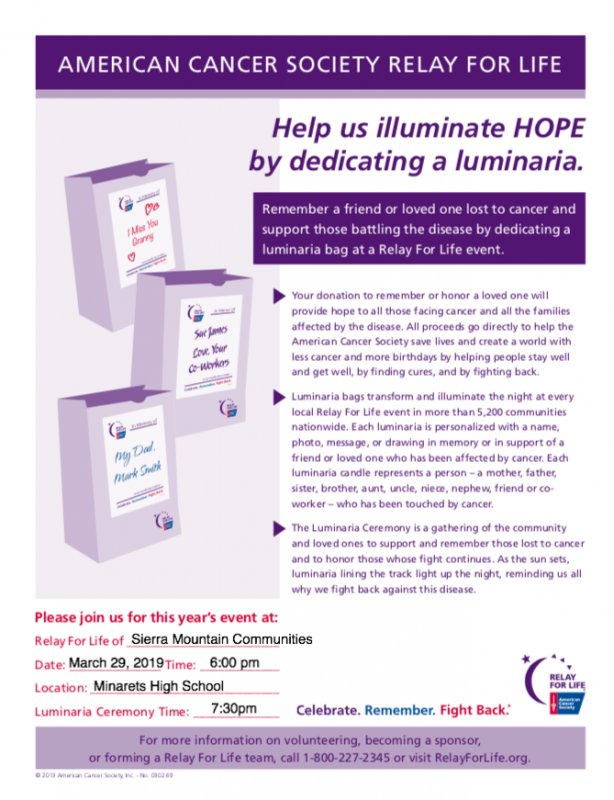 O’NEALS — As the Sierra Mountain Communities for a Cure gear up to celebrate, remember, and fight back against cancer at the annual Relay for Life on Friday and Saturday Mar. 29 and 30 at Minarets High School, another time-honored event will take place: the Luminaria Ceremony. 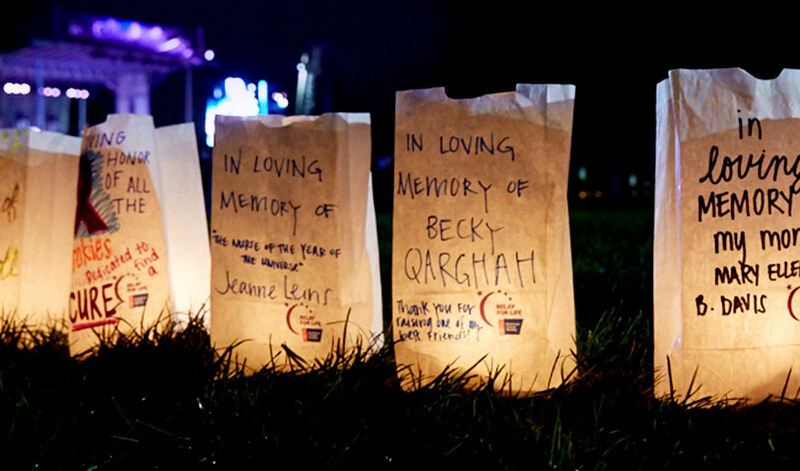 In this case, a luminaria is a paper lantern that is dedicated to a loved one lost to cancer, someone currently battling cancer, or anyone who has overcome cancer. These lanterns are decorated with names and, sometimes, messages are part of the dedication. At the Luminiaria Ceremony the paper lanterns are lit and the activity give participants the opportunity to remember and hope. It is a time to grieve for those we have lost, to reflect on our or our loved one’s cancer experience, and to find hope that tomorrow holds the promise of a cancer-free world. Want to honor someone whose life has been touched by cancer? 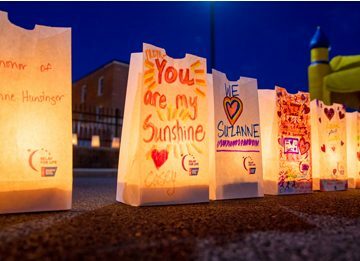 You can make a $10 donation for a luminaria and the proceeds will help fund the American Cancer Society’s mission to help save lives. The Minarets California Scholarship Federation (CSF) Team is in charge of the luminarias and the Luminaria Ceremony, and there are a few ways that you can go about ordering one. The easiest way to do this would be to order online through the Relay for Life website where you can select the participant, team, and/or event (Sierra Mountain Community) that the donation will be credited to. You will also be asked who the luminaria will be dedicated to along with an optional messages. These bags will be decorated by the Minarets CSF team. Starting on Feb. 27, Minarets CSF team will be selling luminarias every Wednesday at lunch where you can pick up donation forms, submit your donation, and decorate the luminaria yourself. Don’t forget that the Relay for Life starts on Friday, Mar. 29 at 6 p.m. and goes until 3 p.m. on Saturday, Mar. 30. The Luminaria Ceremony is scheduled to take place at 7:30 p.m. on Friday at the Minarets High School Track. Support the fighters. Admire the survivors. Honor the taken. Read the original article on Minarets Press.